MACEDA: They call it Kremlin Inc., capitalism with Putin himself as the ultimate CEO. In this system, the line between strategic resources, oil and gas, and political power is not only blurred, it doesn’t exist. 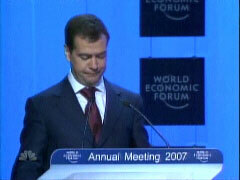 Take Dmitry Medvedev, Gazprom’s chairman of the board and deputy prime minister. Many believe he's a front-runner to succeed Putin. It’s as if Microsoft’s Bill Gates were US secretary of commerce as well. Assuming he wasn’t engaged in a childish game of gotcha, the point of Russert’s debate question is that our presidential candidates need to have some basic knowledge about the leaders of crucial nations like Russia. If so, then shouldn’t NBC News spend at least a few minutes on the subject? Russert may have thought he was exposing the candidates’ lack of knowledge, but he also exposed the superficiality of NBC News.